There is a good chance that your recent energy bill was quite high - maybe even higher than usual. This is because the summer forces you to utilize a number of appliances that demand more energy. Namely, your air conditioner is working on overdrive to cool your home, so that you can beat the heat and live more comfortably. However, there are a number of reasons why your energy bill may be higher than it should be. You may have an energy leak. You also may be leaving lights on and leaving certain gadgets plugged in longer than they should be plugged in. Luckily, there are a number of ways to reduce your energy usage and save money. Here are five effective ways for homeowners to cut summer energy bills. 1. Lower your reliance on your air conditioning system. If you read the heating and air conditioning FAQs on any HVAC website, you will notice questions regarding high energy bills popping up a lot. This is because a lot of people wonder how they can reduce their utility costs. Well, the simplest way to reduce your costs is to reduce your reliance on your air conditioner - try programming it, so that it only goes off when you need. In most cases, you don't need to run your air conditioner all day and night. 2. Use fresh air to cool your home. Another way to cut summer energy bills and reduce your reliance on your air conditioner is to use fresh air to cool your home as opposed to the air conditioner. At night - when the weather is particularly moderate - you want to open your windows and let the fresh cold night air in. In the morning, you can close all the windows to trap the air inside. This can significantly cut costs, because the cool night air is totally natural. 3. Make sure to turn off lights and unplug appliances. It is critical that you unplug all the different appliances in your home that you typically leave plugged in, like computers, cell phones and even televisions. Even though these items are plugged in, they are still using energy. Also, you want to remember to turn off lights before you exit a room - in the summertime, leaving on unnecessary lights is one of the best ways to waste money and energy. 4. Utilize ceiling fans. If you want to cool down a certain room, you can get a lot of relief from the heat by using a ceiling fan. Ceiling fans have the power to circulate the air in a room, which can ultimately cool it down. Plus, sitting under a ceiling fan can offer a tremendous amount of relief. Just remember, though, to turn off the fan when you leave the room. 5. 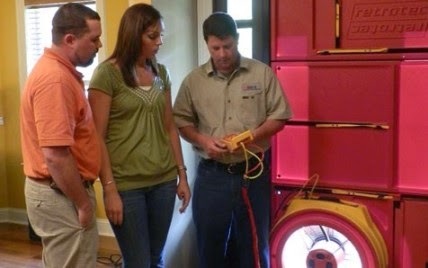 Update or maintain your HVAC system. Another effective way to cut costs is to maintain or update your air conditioning system. If you have an older system, you may want to think of purchasing a new one. If the system you currently have is relatively new or still operable, you may want to replace the filter, clean the coils and wipe down the fan. In the end, the more effective your air conditioner, the lower your energy bills will be.